For back cover blurb and more information about this book visit Crista's website here. When someone begs... no, offers to pay you to write letters to get rid of a suitor just say no! In Susanna Parkwell's case she can't turn away the offer for a few extra coins. Especially when her brother desperately needs the money to continue his education. What Susanna doesn't expect is to become enthralled with the very man she's supposed to rebuke. Susanna is a bit of a day dreamer, surprisingly enough since she's survived the Civil War and lost everything she holds dear. At the same time Susanna has a practical and near cynical view of the fairy tale ending that she secretly longs for. I do believe the lady protests too much, and indeed it's not long before Susanna finds herself wishing the man behind such poignant responses to her witty diatribe would come and sweep her away. Theodore at first glance appears to be a bit of weakling. He's guided by his father's purse strings and not much else. When his father informs him that he must marry, and that a match has already been selected he merely gives in to the inevitable. This trait did not endear Theo to me in the least, but I kept reading... hoping for Theo's redemption. Honestly he's a hero, so he better do something amazing. McHugh quickly turned the tables. Theo's capitulation to his father's desires is just one of many facets to his character. The truth of Theo becomes apparent through the correspondence with Susanna. The climatic meeting, and the events that follow are a Cinderella dream. Overall, A Waltz at Midnight is endearing, and speaks to the little girl inside every woman that's looking for her prince to ride in on the white horse. 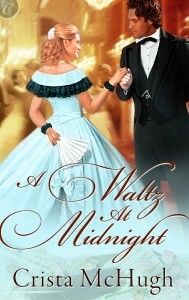 Researching McHugh's previous writings revealed this is her first foray into the Historical Romance genre. After getting a small taste of what she's capable of, I can only hope there are more Historical Romance books on the horizon from this author!